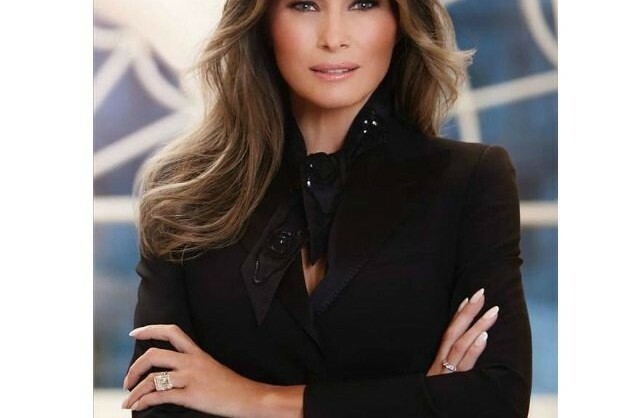 The White House released its first official photo of First Lady Melania Trump, the Daily Mail reported. The image shows the first lady in front of the White House residence, wearing a black jacket, black scarf, and showcasing a diamond ring President Trump bought her for their 10th anniversary. In the image, she looks straight into the camera and is standing in front of one of the arched windows of the residence. Photographer Regine Mahaux took the photo the day after the inauguration on January 20, the Hill reported. Melania Trump currently divides her time between Trump Tower in New York City and the White House in Washington, D.C. so her son Barron can finish up the school year at his school in New York. The first lady recently made her way back to D.C. when she handed out awards at the 2017 International Women of Courage awards ceremony Wednesday at the State Department.